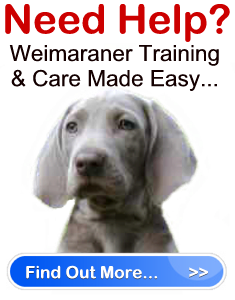 Weimaraner Breeders & BARF " "
There are many different types of Weimaraner breeders you can choose from depending on where you live, and what you are looking for in a breeder. That being said, did you know that there are breeders who support the BARF diet, and will raise their liters on such a food regimen? Not familiar with the term BARF diet? Don’t let the name fool you. While your first impression may be regurgitated food, wipe that impression from your mind. In actuality, BARF is the acronym for Biologically Appropriate Raw Food – or the more common – Bones And Raw Food. The BARF diet is designed for house pets and wild animals. Some Weimaraner breeders believe that the BARF diet is the better choice for dogs, and will choose to raise their dogs on this diet. Why? The reason is because these breeders believe that the diet of a dog is closely connected with their health, natural instincts, and temperament. In other words, the principle behind the BARF diet is that the way a puppy is fed can lead to health disorders and behavioral problems. While it is true that your dog’s temperament is a result of how well he is socialized, trained, and the amount of love and attention he receives, natural nutrition plays a key role in his development. BARF Weimaraner breeders believe that it is vital to match the requirements a puppy’s body needs to his natural food heritage, as well as to the necessary exercise his ancestors would have received. The understanding is that the more humans divorce a dog from his biological heritage, the more he is at risk of not functioning as nature intended. A reputable BARF breeder will help new owners, and experienced dog owners new to the BARF diet, understand the importance of feeding their puppy biologically appropriate raw food. They will teach you the best foods and portions to feed your dog so he can live a healthy and content life. After all, a BARF diet doesn’t mean you feed your dog just any regular “human” food. Thus, it is imperative you know what you are doing before jumping head first into this form of feeding. Remember, as with all weimaraner breeders, you must make sure that the BARF breeder you find is legitimate. This means that their puppies are registered, well socialized, have received vet checkups and all the other standard policies that are required of reputable dog breeders. Finally, keep in mind that it is a good idea to research the BARF diet before you begin looking for Weimaraner breeders. That way you know what you are committing yourself to without any surprises.